I want a style reboot. Where do I start? Come January 1, we know that pushing the restart button is top of mind—and that goes for our wardrobe, too! First things first in the new year: find your style muse! Then, add newness back to your closet with these 5 year-round staples to set a foundation for a stylish new year. 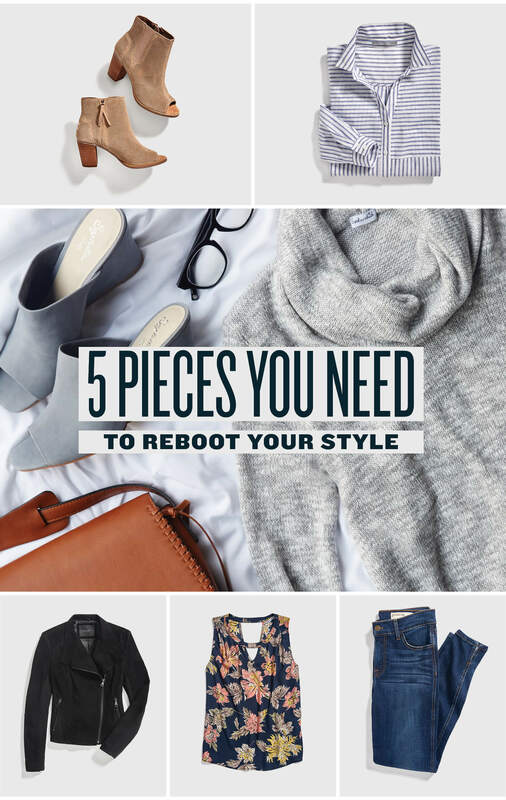 See how to reboot your wardrobe with these 5 Stylist-recommended pieces. First things first, a new year calls for new jeans. Finding the perfect pair not only will make you feel good and look great, but they set the foundation (literally) for most womens’ wardrobes. Need help with fit? Start with understanding rise and inseam to find the perfect pair. Booties are the most versatile shoe in your arsenal. If you already own a pair—try a heeled version to put a dressed-up pep in your step. Want something totally new? Try a pair with an open-toed or a spring-forward option with perforated details. The outfit options for a button-up blouse are endless. Try a striped version for work that can easily go straight into the weekend. Time-tested and cool-girl approved, a moto jacket adds a bit of edge to your everyday dresses, denim and skirts. Mix it into both your work and weekend-wear rotation for effortless style. If you’ve been into tonal outfits or a certain color palette du jour (or year), reboot your wardrobe with a fresh new print. If you’re a black and white type of gal, go all out with a floral print to mix it up in the new year. The best part about rebooting with five pieces? You can let your Stylist know exactly what you’re looking for in 2018 and your next Fix. What piece are you going to ask your Stylist for?